The webisodes recently got some good press, with the New York Times saying the series "could serve as a model of the Webisode genre" and applauding the care taken on the 'sodes. The Boston Herald calls it "gripping storytelling" and thinks the 'sodes are "a nice way to reward fans for their patience" during the hiatus...Bravo. Oh and Canucks? Space is now rolling out the 'sodes as well, over here. Can be found over here today. Two new interviews with Ron Moore are on the interwebs as we get to the final weeks of waiting. Scanner: You admitted recently that Battlestar's themes of faith and religion were something the network requested after reading a line in the miniseries. How did it evolve? Moore: It was very natural. At Trek I was always trying to work in those angles and blur peoples' religions, but it was very much not a part of what Trek was about -- it just wasn't part of Gene's vision. It appealed to me because science fiction shows just didn't go there. I thought the idea of robots who believe in God was just a fascinating concept. And then I really liked the idea of the polytheists versus the monotheists, and that the monotheists were actually the "bad guys" because there's certain repetition in Western society of the one God driving out the many. There were just layers and layers to play with. He also addresses two items that some fans have worried over intensely: the final cylon reveal…and Moore’s now infamous love of the ending of THE SOPRANOS. To the former, he fesses up that “the ‘Who Shot JR’ of it all” will undoubtably set some of you viewers up for a letdown (and that the reveal is coming before the end of the series). And as for the fear that he wanted to end his show the way David Chase did? Moore: I felt like the series I was telling, unlike The Sopranos, had a beginning, middle and end. So as much as I love The Sopranos, I never seriously thought that was an option for us because it's just not part of our narrative. Theirs was about these characters' lives that presumably were going to continue beyond the final fadeout. Our finale will be the end of our narrative, the period at the end of the sentence. "I was delighted when the 'Caprica' pickup came," said Moore. "I was delighted that the 'Battlestar' universe would continue, and I could continue to play in that world, much more than I thought I would. I really thought of them as very separate projects, very separate moods and feelings to them, and I really wasn't connecting one to the other. But when the pickup came, I'd already completed most of the post-production work on the remaining episodes of 'Galactica.' It was something to look forward to and go, 'Wow, there really is something more to tell in this world.'" 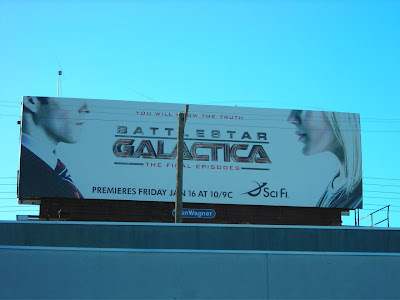 Of course, the whole theme of "Battlestar Galactica" is humanity coping after the fall, but "Caprica" goes back to when the residents of the 12 Colonies are riding high. Asked if this poses a challenge in finding the right tone while retaining the "Galactica" flavor, Moore says, "'Caprica' is a period piece in 'Galactica' terms. The way the pilot turned out, so strong, and the fact that it did feel like it stood on its own two feet and was a genuinely different period of time to deal with...I don't know. I liked the vibe of it." "I'm very encouraged to see what we can do." "The hours don't mater; the money doesn't really matter; nothing matters except that credit. You can say, 'I was on that show.' You can look back and say, '"Battlestar Galactica," I'm proud of that.' I wanted everybody to sign on it when they came aboard, and I think they did. I think it shows in the product. It is informed by good decisions of hundreds of people beyond me, who made decisions on every little piece, on every prop, on every costume, every visual-effects shot, every sound effect, on and on and on. All these people took great pride in what they were doing, and they wanted it to be the best it could possibly be." Yes, the rumor is true: several webisodes have (accidentally we assume) been posted here ahead of their official premiere. You can see eps 6, 7, 8...and 10. 9 is missing. Better hurry! By the way...I don't know what this means. Or this. But ain't it fun to wonder. Webisode: Face of the Enemy #5. The first set of promo photos for season 4.5, episode 413 "Sometimes a Great Notion," have surfaced. Many thanks to uberfan dryope for sharing with us hoi polloi. The Los Angeles Times thinks finding Earth on BSG was one of the best moments on TV this year. Jane Espenson has been busy talking to Sci Fi Wire about THE PLAN, the webisodes, and her new gig working on DOLLHOUSE. So busy is Jane, in fact, that she's apparently ending her blog on TV writing. Another busy one: Mark Sheppard, who spoke with iF Magazine about his work on the new show LEVERAGE, as well as the BSG finale and his parts on DOLLHOUSE and MEDIUM. Random Mary McDonnell-related sidenote: the director's cut of DONNIE DARKO hits Blu-Ray early next year. 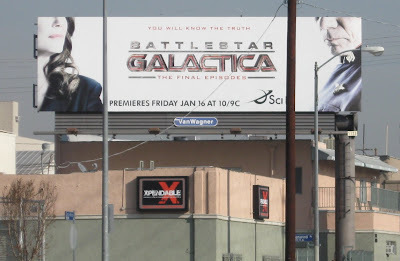 Time Magazine picks BATTLESTAR GALACTICA as one of the Top Ten TV Shows of 2008. 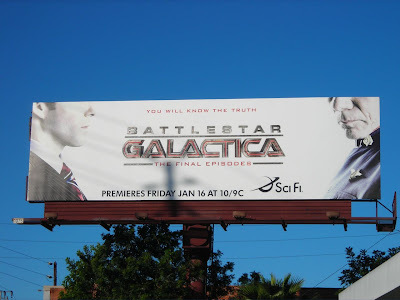 MediaPost reports on new TV audience research that reveals BATTLESTAR GALACTICA has "a whopping 53% of its household viewing -- more than half of its overall viewing -- watching after its original episode premiere" on DVRs. The highest time-shifted viewership in all of televisionland, according to Nielsen Media Research. 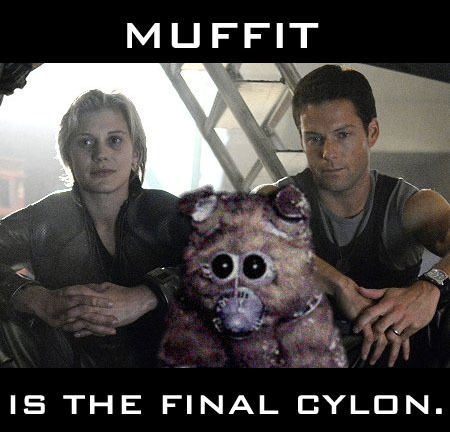 h/t tracyloowho via BSG blog. The Amazon sale on Seasons 1-3 plus RAZOR on DVD has now gone down to a pretty frakkin great price of $99. This may seem a tad picky...but for anyone else who appreciates BATTLESTAR GALACTICA's wondrous visual effects shots, let it be noted for the record that Hulu's webisode stream looks MUCH better on full-screen mode than either SciFi.com or YouTube versions. I realize none of us fanatics would wait out the 1-4 day delay for vids to show up on Hulu...but it's definitely worth a second look once it posts there. Thanks to reader redwards95 for pointing out that the webisodes are also posting to Hulu's even better-looking HD high-res 480p stream, if your connection can handle it. 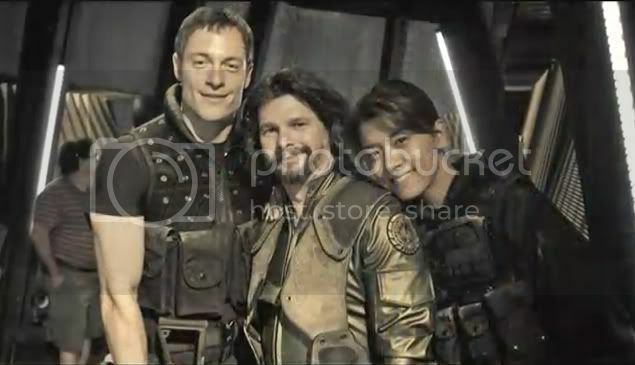 Maureen Ryan of the Chicago Tribune posts this reminder about the BSG Face of the Enemy Webisodes, and showcased the new BSG season 4.5 poster with Starbuck seen above. 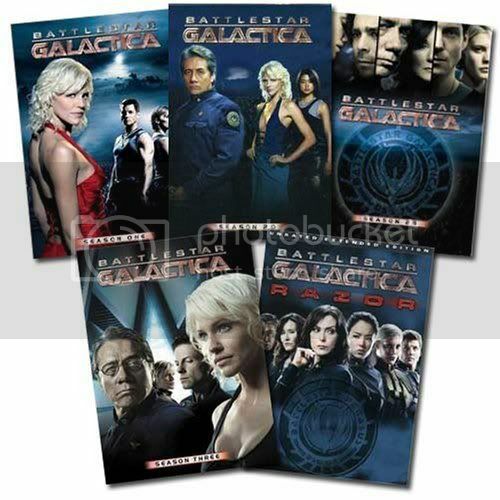 Mo Ryan also has gone on her own Galacticathon re-watching Battlestar Galactica from the beginning, her observations and thoughts are here and here. Also, not to long ago, Ryan talked to the Daily Show's Resident Expert, John Hodgman who is a huge BSG fan, and who has a cameo role in season 4.5. 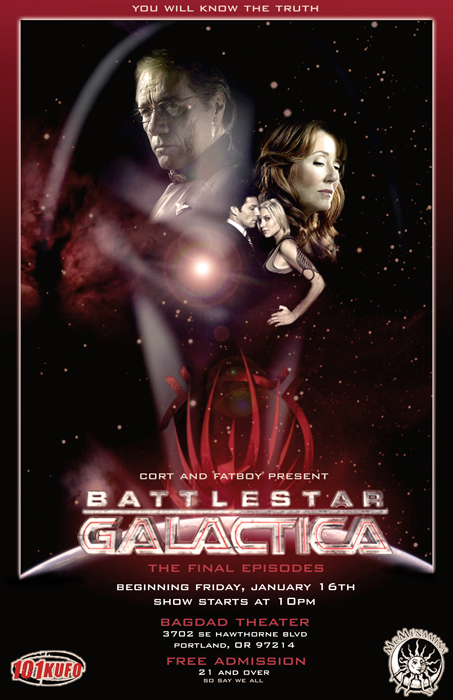 Time Magazine lists Battlestar Galactica as the 8th best show of 2008 on their top ten list, and ranks the episode Revelations as the 6th best television episode of the year. And Apple includes Battlestar Galactica in their best of 2008 iTunes selections. Michael Hogan talks about coming to Galactica's end with DreamWatch's Total Sci-Fi. In other news, Tricia Helfer is to appear in an episode of Chuck. Check out some set photos from Michael Trucco....Interviews with Tahmoh Penikett....And Michelle Forbes talks about working on True Blood, In Treatment, and Battlestar Galactica. Hmm. Is that news is making you even more nervous than Fox’s previous announcement about DOLLHOUSE getting a death slot? Well here’s something that might cheer you up: through some random googling, Sitrep has discovered that Wendy & Lisa are working on the musical score to the VIRTUALITY pilot. Which will be great stuff, I'm sure. (W&L fans out there: apparently they are also about to release a new record, their first in 10 years). Wendy & Lisa's music has been featured on HEROES, CARNIVALE, CROSSING JORDAN, and they are also working on the new Showtime series NURSE JACKIE with Edie Falco. Polly Walker (CAPRICA) has become a BSG fan while catching up on the show, and is looking forward to going to fandom conventions. And we are looking forward to having you, my dear! Jane Espenson, BSG writer, BSG webisode writer, and writer of the post-series TV film BSG: THE PLAN, will be a guest on SyFy Radio December 18th. Galactica.TV has been posting tons of new interviews during the long hiatus, including Michelle Forbes (Cain), Carl Lumbly ("Bulldog")...and Tiffany Lyndall Knight (The Hybrid). Bear McCreary’s score music for TERMINATOR: THE SARAH CONNOR CHRONICLES is now available on CD…and you can have Bear sign one for you this Saturday in Los Angeles. Holiday Merch Alert, part 2: did you know that the NBCU-SciFi store has released a new version of the infamous Frakkin' Toaster ? And this version puts WORDS on your toast? your Valentine's Day breakfast, don't it? This time it's Part 1 of Katee Sackhoff. Cort & Fatboy (who I keep telling you to go listen to on a daily basis) have some great news for you PDX BSG lovers! Every Friday at the Bagdad Theater in Portland, OR, starting January 16th, Cort & Fatboy are gonna have a big, free, Galactica viewing party on the big screen. You gotta be 21 and over to attend because the Bagdad Theater is a brewpub. Will anyone step up in NY or LA and do this? We shall see. I am not making this up. I swear. I'm not, Mark Verheiden said it! Congrats to Bradley and the new Missus, who we are assuming is the delightful lady known on the Sci Fi message boards as Mexichick. Cheers! Need a refresher on the show before it starts next month? SciFi has updated their WHAT THE FRAK'S THE DEAL WITH BSG? video and now it's called CATCH THE FRAK UP. Ferreals. Meanwhile a page has gone live for the BSG season 4.5 webisodes, which begin this Friday at Noon EST. Ron Moore (and Joss Whedon and Seth MacFarlane) on the season premiere of ROBOT CHICKEN...Warning: so, so NSFW. A peek at Katee Sackhoff on NIP/TUCK's new season, which starts January 6. The always dedicated fan SevorTB has uploaded two BATTLESTAR GALACTICA season 4.5 preview clips that aired tonight during the broadcast of STARGATE ATLANTIS and SANCTUARY. Enjoy! 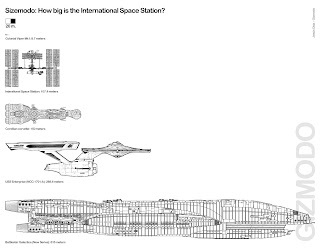 Gizmodo ponders the size of the International Space Station as compared to SF spacecraft including the Battlestar Galactica. If you've never seen the ISS fly over from the ground, click here to see when the station will pass over your area. At least most of us can afford the printed catalog, available for purchase beginning next week. According to Propworx there will be additional photos and information going live at www.auctionnetwork.com shortly as well. Richard Hudolin, Production Designer 11:00 a.m.
Ken Hawryliw, Prop Master 12:00 p.m.
Doug McLean, Art Director 1:00 p.m.
Jonathan Lancaster, Set Decorator 2:00 p.m.
Glenne Campbell, Costume Designer 4:00 p.m.
Mo Ryan has confirmed with sources close to the show that BATTLESTAR GALACTICA's final set of webisodes will begin online December 12th. Two per week will be posted for five weeks. As an unrelated note, she also has confirmation from the network that the post-series TV film title really, truly is BATTLESTAR GALACTICA: THE PLAN. The 10 webisodes, entitled "The Face of the Enemy," tell a story that takes place between seasons 4.0 and 4.5 of Battlestar and follow Lt. Gaeta when he is sent off in a Raptor with a handful of strangers and one of them mysteriously dies. The psychological human-vs.-Cylon struggle is played out in the restrictive confines of a Raptor as everyone is a suspect, and paranoia sets in among the group. Grace Park and Michael Hogan also star.